Which Image is the Sharpest? Here's a fun quiz: Which of these six images is most likely the sharpest? You'll need to click on the picture to zoom it out to see the real clue. For those of you who have my Digital Photography Hacks book, the answer is actually one of the hacks. This is a trick that I've used for years when I have to turn around photos quickly and don't have time to examine each one of them at 100 percent magnification. 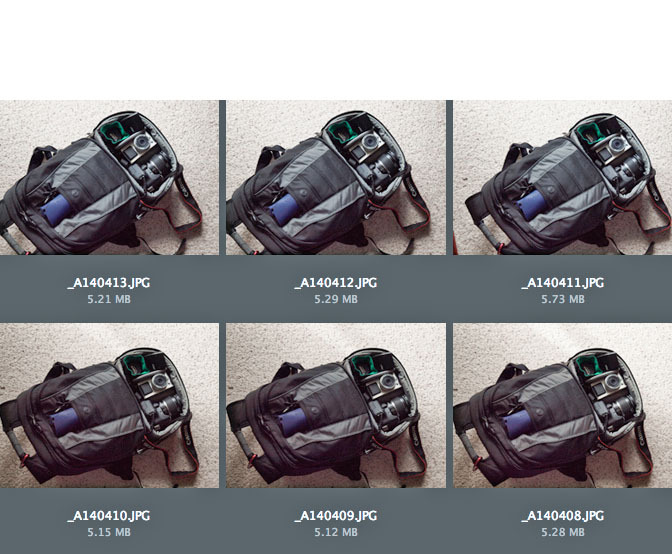 Often, I'm just looking at thumbnails in Adobe Bridge, as described in my Photoshop CS4 Companion for Photographers, and I need to pick one quickly, process in Adobe Camera Raw, then send it on its way. So, use this article's "Leave a Comment" to state which of these six thumbnails you think represents the sharpest image. I'll post my answer at the end of the day. It's probably the top-right one. The one with the largest filesize. Generally, if there is little noise (which jpeg compression doesn't deal with well) in the image, jpeg filesize correlates with the amount of detail. It is the one labeled _A140411.jpg. That is a very good trick and one that I keep forgetting to use when in a rush. Thanks for the reminder. I agree with Jao. It's hard to tell at the size you have posted even when I click on them. The noise looks even in all of them. so I'd go with _A1401411.jpg on the top right since it's the largest. Yes, it is A140411. Why? Because it has the largest file size. 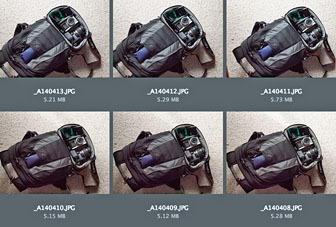 All other things being equal, images with the larger file size will have more detail. It's a simple trick, but one that I use over and over, and thankfully so.